Cer­ti­fied Eth­ical Hacker is a pro­fes­sional cer­ti­fic­a­tion offered by the EC-​Council (Inter­na­tional Coun­cil of E-​Commerce Consultants).The course exposes learners to stand­ard hack­ing prac­tices with the aim of giv­ing them hands-​on-​experience on identi­fy­ing, coun­ter­act­ing and pre­vent­ing these attacks. Upon com­ple­tion of the cer­ti­fic­a­tion exam­in­a­tion, learners become Cer­ti­fied Eth­ical Hackers. CEH train­ing is for IT pro­fes­sion­als and stu­dents who want to become Cer­ti­fied experts in eth­ical hack­ing. It is ideal for indi­vidu­als who want to gain hands-​on-​experience on identi­fy­ing, coun­ter­act­ing and pre­vent­ing IT Secur­ity attacks. @iLabAfrica — Strath­more Uni­ver­sity, is a cen­ter for Excel­lence in IT Secur­ity. We have partnered with the best of Industry in IT Secur­ity, to ensure you get industry stand­ard skills and training. Learners will be exposed to an entirely dif­fer­ent way of achiev­ing optimal inform­a­tion secur­ity pos­ture in their organ­isa­tions. With this train­ing, they will scan, hack and secure their own sys­tems on a vir­tual environment. 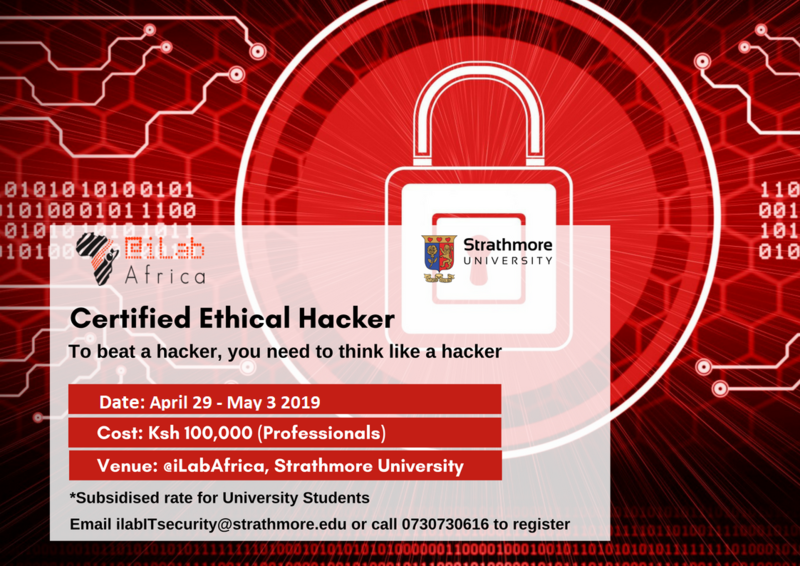 Fol­low­ing the train­ing, learners will be able to take the cer­ti­fic­a­tion exam in Strath­more Uni­ver­sity and receive the inter­na­tion­ally recog­nised cer­ti­fic­a­tion Cer­ti­fied Eth­ical Hacker. Ensure that you specify the CEH course when paying at the bank. NOTE: Please ensure you indic­ate the name of the course e.g CEH while mak­ing the payments.